Lasers with special properties are required for telecommunications applications. Both fiber-coupled laser diodes and bidirectional emitters are used for data transmission with optical fibers. The Photline line range of ModBoxes incorporate a high bandwidth LiNbO3 modulator, with an automatic bias control circuit and laser source and high performance RF drive electronics tailored to the application to deliver state of the art performance. Telecom ModBoxes are mainly used as reference transmitters to characterise network components, such as optical receivers. They are also used in laboratories for the development of next generation telecom devices. The telecom ModBoxes offer the ultimate performance in terms of rise and fall time, jitter, eye stability to measure the signal impairments caused by the network and its components. There are a range of models for a variety of modulation formats and wavelengths, with options including, variable extinction ratio, stressed-eye and multiple wavelengths or tuneable lasers. Analogue ModBoxes are specially designed for operations in an analogue environment. They can be used for RF over fibre (RFoF) links, analogue devices characterisation and test and measurement. They include the ModBox-VNA family which, when associated with a vector network analyser, make a highperformance and easy to use piece of test equipment for the characterisation of photoreceivers or any high speed optoelectronic device. ModBox for Pulse Applications use the benefits of Photline modulators, short rise and fall time, high contrast and high power handling, to generate, shape or select high quality and highly repeatable optical pulses. There are available in a large choice of wavelength and can be tailored to specific applications. 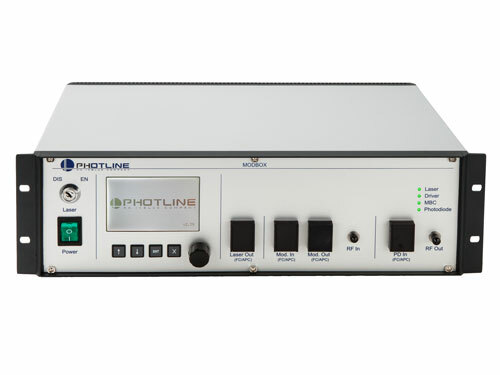 Photline ModBox-Pulse and Front End systems are used in many high energy laser facilities around the world including, Lawrence Livermore National Laboratories, CEA Mega Joule, LULI, and ILE Osaka University.